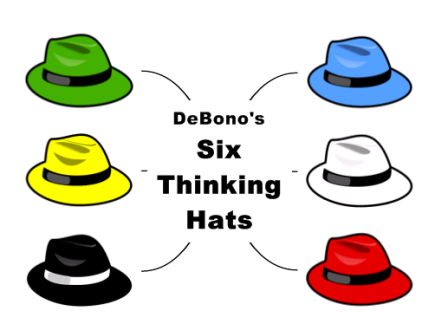 I see only three of your hats (white, yellow, and black) clearly matching De Bono. But patient, wisdom, rebel are your own categories. How do they tie to blue (process), red (emotional) and green (creative)? I don’t think “patient” is a way of thinking so much as it is a long term time frame. “Rebel” is a poor choice. Perhaps that is the green or creative? Investing involves non-consensus views, i.e. finding flaws in the conventional wisdom, but “rebel” does not capture it as well as other words would.